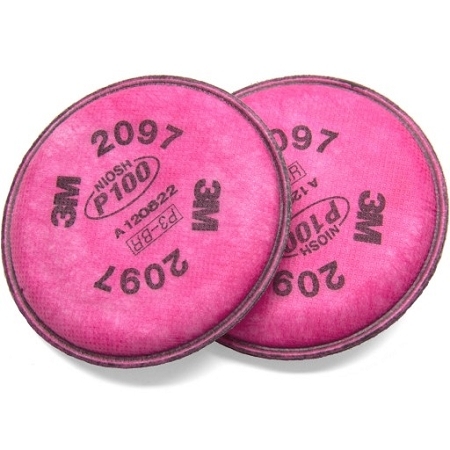 3M 2097 P100 HEPA Particulate Filter with Nuisance Level Organic Vapor Relief and Ozone Protection. HEPA filtration is rated to remove 99.9% of particles 0.3 microns and larger. The 3M 2097 P100 Filters fit the 3M 6000 and 3M 7500 series half masks, as well as the 3M 6000 series full face respirators. Mask not included with this item. Use this filter for protection against toxic dusts such as lead and asbestos, and for mold cleanup and remediation, and arc welding. The 3M 2097 P100 Filter's extremely fine filtration traps all but the most minuscule particles. They protect against asbestos and lead dusts in particular, as well as a host of other dusts, allergens and fumes. The filters are extremely lightweight and flexible and they fit tight against the mask, which makes wearing this type of mask more comfortable.